My first conscious acquaintance with Swedish murder squad MZ.412 was through the Cold Meat Industry-release In Nomine Dei Nostri Satanas Luciferi Excelsi, about twenty years ago. I was so overwhelmed, because back then I was not that trusted with the harsher Industrial / Noise scene (yet). Soon I found out that this combo acted under the moniker of Maschinenzimmer 412 before, and nowadays I am sort of ‘fan’ of most things these sick minds have done, under this specific moniker or others (even the Al-Wahaar Dhin project cannot totally be disliked by undersigned). I have to admit that the In Nomine Dei Nostri Satanas Luciferi Excelsi-album must be my favourite record ever done by this ‘band’, but almost every single release (including the live efforts) are highly appreciated. This goes as well for the many side-projects these (human) beings are involved with. But let’s focus on this album, Hekatomb, which was the manifestation of MZ.412’s performance at the live celebration of Cold Spring Records (once again, labels like this one, or Cyclic Law, sort of pleasurefully continue the legacy of mighty Cold Meat Industry, and therefore: hail! hail! hail!!! ), to celebrate this label’s 21st anniversary (congratulations, by the way!). And hey, this performance was done by, indeed, the initial (live) line-up of the band, being Henrik ‘Nordvargr’ Björkk, Mr. Drakh and Jouni Ulvtharm (tears of melancholy drop out of my pretty eyes, but that’s another issue). 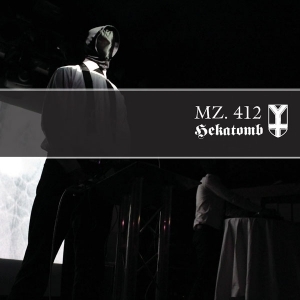 Anyway, this performance, decently compiled under the Hekatomb banner, features slightly adapted interpretations, expressions and explorations of existing MZ.412-stuff, created throughout the past two-and-a-half decade. The ceremony clocks nearly one hour and believe it or not (but why shouldn’t you): this sonic expression of evilness indeed stand for the aural supremacy this project has always been standard for. And please allow me to quote the label’s bio: ‘powerful, pounding Industrial, desolate drones, dense electronics, grim nefarious rituals’ … ‘satanic, blackened ritual from the creators of Black Industrial will evolve from memory, to history, and into legend’. Doesn’t this sound sweet?... Yet indeed, with exception of only a handful of bands (within the Industrial spheres), like Raison d’Être or Deutsch Nepal to name but a few, there are almost no acts that achieve to deserve such honourful proclamations.